Cafe De Paris New Years Eve 2018 – 2019 | The Hottest London Nightclubs - Get on the Guestlist & Book a table! Come and join us for a night of pure luxury and party through to 2019 in true style at Cafe De Paris New Years Eve! Cafe De Paris is one of the longest standing high end clubs in central London. Since its opening, Café de Paris has played host to notable members of the aristocracy including eminent political figures, famous faces from television and film and even royalty. Cafe De Paris features outstanding cabaret showcases featuring exclusive guests at the biggest weekly variety show of cabaret. With Cafe De Paris’ grand sweeping staircases, original features and glamorous chandeliers, Cafe de Paris has thrown some of the most memorable and exclusive parties London has ever seen as well as intimate events. You will not want to miss the biggest party of the year at Cafe De Paris New Years Eve! We look forward to seeing you there. We will have luxury canapes and an exclusive champagne reception from 9:30 pm. Please make sure to dress as elegant and sophisticated as you can, think royal gala or the Oscars! Our guest DJ Guy D’Angelo will be supplying a mix of club and party anthems from 9:30 pm till 4:00 am! 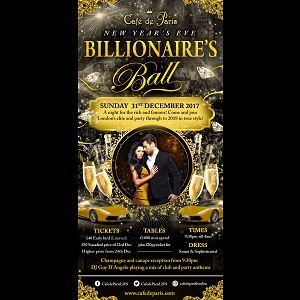 A night for the rich and famous is in store with your Cafe De Paris New Years Eve tickets! Tickets will be limited so we advise buying your tickets as early as possible as it’s always a sell out for our biggest event of the calendar year. Tickets are £50 each for guys and girls.